Genesis Vitamins happily accepts the following credit cards as payment for your order: Discover, American Express, MasterCard, and VISA. Money orders or cashiers checks payable in US funds are accepted on a pre-payment basis only. Genesis Vitamins is not responsible for typographical errors or pricing mistakes. In the event of a price mistake, Genesis Vitamins will contact you to correct the problem. Pictures are for illustration purposes only and may vary slightly from products in stock. All products on the web site are assumed to be in stock. If an item is out of stock, we will attempt to notify you. We reserve the right to remove items from orders and/or ship orders incomplete. Genesis Vitamins makes no claims as to the compatibility of its products with prescription or over-the-counter drugs. Consult your doctor before taking any supplements, natural or otherwise. Sole liability for the use of any products purchased on this web site is assumed by the customer. 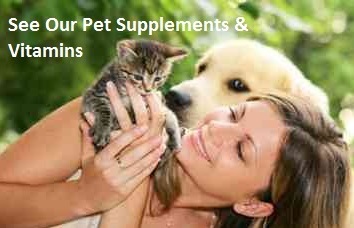 Genesis Vitamins is dedicated to ensuring you are pleased with the product you purchase from us. We offer a full refund for product returned within 10 days of purchase. The product should be in its original unopened packaging. Sorry we do not offer refunds on opened products. Please email us at sales@genesisvitamins.com for complete instructions on how to handle the return, this email is checked daily so you will recieve a quick response, and will be instructed on the proper steps on where to return the merchandise. Returns must be shipped freight prepaid, we recommend sending the product via a traceable carrier (UPS, FedEx) and insure it for the value of the contents. The cost of the product, minus shipping - will be refunded to you. If you wish, a credit can be applied to your Genesis Vitamins account to be used towards future purchases - let us know which you prefer. Damaged Merchandise product may get damaged when shipped. If this is the case, please contact us within 24 hours of receipt at build531@aol.com so that we can resolve the issue. Please remember to keep the box and packing material the merchandise arrived in. We can replace the merchandise or issue a refund once the damaged item has been returned to us. Your satisfaction is what we care about. Most orders within the continental United States are shipped via UPS Ground. If there are any delays in processing your order, you will be notified. Normal delivery within the continental United States is approximately 7 business days. Shipping charges are calculated using standard ups rates based on weight, package size, and distance. To be eligible for "Same Day Shipping," the item(s) must be in stock and the order must be received NO LATER THAN 2PM Eastern. Backorders and orders arriving after 2PM may be subject to a delay in shipping time. If you would like NEXT DAY SHIPPING please write it in the special instructions box on the top of the order page. A price for shipping will be e-mailed back within 24 hours during business days only. Genesis Vitamins can not ship to Post Office Boxes. For further details please e-mail us at sales@genesisvitamins.com. For international shipping rates, please call or e-mail us. There are no exceptions to this rule. All trademarks, service marks, and trade names are proprietary to Genesis Vitamins. ALL RIGHTS RESERVED. All other trademarks, product names, and company logos appearing on Genesis Vitamins are the property of their respective owners. Disclaimers and Limitation of Liability: User agrees that use of Genesis Vitamins is at User's own risk. Genesis Vitamins nor its affiliates, nor any of its employees, vendors, providers, sponsors, or the like, warrant that Genesis Vitamins will be uninterrupted or error-free; nor do they make any warranty as to the results that may be obtained from the use of Genesis Vitamins, or as to the accuracy, reliability, or currency of any information content, service, or merchandise provided through Genesis Vitamins. Genesis Vitamins is provided on an "as is", "as available" basis without warranties of any kind, either expressed or implied. No oral advise or written information given by Genesis Vitamins nor its affiliates, nor any of its employees, vendors, providers, sponsors, or the like, shall create a warranty; nor shall User rely on any such information or advice. Under no circumstances shall Genesis Vitamins or any other party involved in creating, producing, or distributing Genesis Vitamins be liable for any direct, indirect, incidental, special, or consequential damages that result from the use of or inability to use Genesis Vitamins, including but not limited to reliance by User on any information obtained from Genesis Vitamins or that result from mistakes, omissions, interruptions, deletion of files or email, errors, defects, viruses, delays in operation or transmission, or any failure of performance, whether or not resulting from acts of God, communications failure, theft, destruction, or unauthorized access to Genesis Vitamins records, programs, or services. User hereby acknowledges that this paragraph shall apply to all content, merchandise, and services available through Genesis Vitamins. Because some states do not allow the exclusion or limitation of liability for consequential or incidental damages, in such states liability is limited to the fullest extent permitted by law. The receipt of an e-mail order confirmation does not constitute the acceptance of an order or a confirmation of an offer to sell. Genesis Vitamins reserves the right, without prior notification, to limit the order quantity on any item and/or refuse service to any customer. Verification of information may be required prior to the acceptance of any order. We are not responsible for typographical errors of any kind. Shipping - Orders shipped overseas are shipped via UPS only. For orders over $100, extra insurance will cost an additional $4. Over $250 will cost $8, over $400 will cost $15. This is in addition to the $13. If you choose not to have extra insurance you will only be covered up to $100 dollars. For extra insurance please write in the special instructions box when placing order. Genesis Vitamins happily accepts the following credit cards as payment for your International order: Visa, Mastercard, Discover, and American Express as long as we can confirm the billing adress with the bank. We will also accept US Postal Money Orders. What about Military Orders - APO/FPO Addresses? Policies the same as international rates. All Military orders are shipped by USPS Priority Mail. US mail to different military addresses takes anywhere from one to eight weeks for delivery as we have been recently seeing delays in military shipments. The US Postal Service has no tracking on military orders. Any damages or claims must be reported to us within 24 hours of receipt of the package. If the package is damaged, take the damaged package to the military postal unit and file a report.